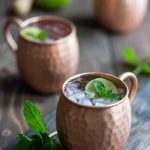 The spicy warmth of ginger beer makes the Moscow Mule a perfect warming cocktail for chilly weather, while fresh lime juice makes it equally wonderful in the summer months! Add the vodka and lime juice to a cocktail shaker filled halfway with ice. Shake until chilled, about 15 seconds. Strain into a mug filled with ice (preferably a copper mug). Add the ginger beer. Garnish with lime and mint, if using, and serve. If you don't have a cocktail shaker, you can fill a liquid measuring cup with ice, add the vodka and lime juice, and then stir to chill the ingredients.